Isn't this week's featured space so welcoming and cheerful?! 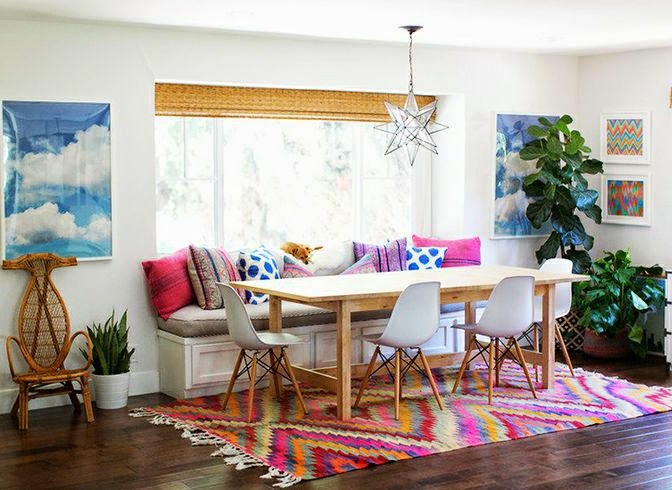 I love the bright and happy feeling that this dining space exudes. Although the room has white walls and light/neutral furniture, it is bursting with personality. The accessories and decor are filled with color, pattern, and texture. There is so much interest, depth, and dimension resulting from the successful layering of textiles, and mixing of colors and pattern. The beautiful area rug that grounds the space also ties in all the colors in the art and accessories. Proper scale, balance, and repetition are what make the colors and patterns work so well together. I just LOVE a cheerful, well-designed room! Thank you so much for taking the time to leave a comment. I truly appreciate your thoughts, and I try to respond to every single comment! Breathing new life into a fixer upper and turning it into our cozy family home! Welcome to CAD INTERIORS, where I share renovation stories, decorating tips, and design projects!